19 yrs of Aikido and Kendo (5 yrs in Japan). Looking for people intrested in learning and/or practicing. 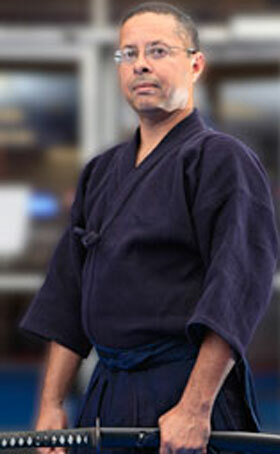 My mission is to spread traditional Aikido and Kendo by instructing any who wish to learn. Began training in Japan in 1994 under Miles Kessler Sensei, Saito Morihiro Sensei and Saito Hitohiro Sensei. Received ikkyu in from Saito Sensei in 1997. Currently training under Gentil Pennewaert Sensei at Newport Beach Aikikai/Shindokan where I joined in 2000. Received 3 Dan Dec 1, 2012 from G. Pennewaert Sensei. Began Kendo at the Yasato-machi Kenyukai in Ibaraki Japan under Inanuma Mitsuru Sensei. Received 2 Dan from Zen Nippon Kendo Renmei (All Japan Kendo Federation) in 1997. Began training at Butokuden Dojo under Maruyama Sandy Sensei and Ariga Taro Sensei in 2007. Received 4th Dan from Southern California Kendo Organization/All US Kendo Federation April 2014. Iaido or Iaijutsu translates to "art of mental presence and immediate action"
Muso Jikiden Eishin Ryu Iaido is a traditional samurai sword martial art that dates back over 450 years. It's emphasis is on the drawing and cutting of the sword in a fluid, concentrated motion. This koryu bujutsu (traditional or old school) martial art focuses on self-discipline and concentration. With emphasis on etiquette and sword technique. The techniques include solo waza, paired exercises, and tamashigiri - test cutting on tatami rolled mats. The Muso Jikiden Eishin Ryu study group in the Central Coast is led by Jen Hooper, and practiced weekly at the Avila Buddhist Temple. 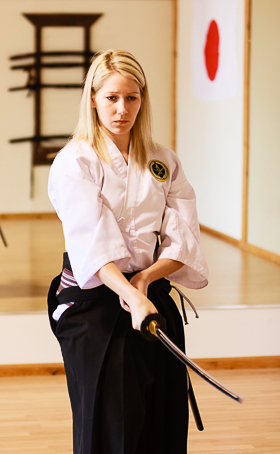 Jennifer Hooper is a Shodan (First degree black belt) in Muso Jikiden Eishin Ryu Iaido. Presented by the late Massayuki Shimaburo Hanshi, Jen's home dojo is Bakersfield Budo headed by Robin Ramirez (Renshi). And has recently attended the Kokusai Nippon Budo Kyokai (KNBK) Instructor training seminar in Kingston Pennsylvania. She has also participated in the Dai Nippon Budoku Kai (Greater Japan Marital Virtue Society) DNBK World Butokusai in Kyoto Japan (2012). For reference "Flashing Steel - Mastering Eishin Ryu Swordsmanship" and "Samurai Swordsmanship, The Batto, Kenjutsu, and Tameshigiri of Eishin Ryu" by Masayuki Shimabukuro are available online or by request. ISBN 1583941975, and 0897501993. Copyright © 2013 Central Coast Aikido Kendo | Professional Website Design by eCasa, Inc.